Based on Sir John Gage, Tudor courtier and soldier (1479-1556), article of David Potter. Born on 28 Oct 1479, only son of William Gage of Burstow by Agnes, the dau. of Bartholomew Bolney of Firle, in Sussex. Escheator, Suss. (1513-14), commissioner for the subsidy, Suss. (1515) and as Justice of the Peace, Suss., from 1514 onwards (he also served on the Surrey bench from 1528). His status as an only son was emphasized by the fact that his sister Margaret was in effect abducted by her husband John Mills, spawning a lawsuit that in the first decade of the sixteenth century John Gage was to blame for his `utter undoyng'. There is no basis in fact for the tradition that after his father's death at just over the age of 50 on 16 Feb 1497, he became ward of Edward Stafford, Duke of Buckingham, since Buckingham was then only 19. Despite William Gage's provision that his wife should have `the custodye, guyding and rule' of his son during his `nonage', in 1499 Gage's wardship and the guardianship of lands in Buckinghamshire, Sussex, Kent and Gloucestershire were acquired by Robert Tate, alderman of London, who milked his property of its revenues. John's mother died on 5 Jul 1501 and he came into possession of his parents' property on his majority in Oct of that year. In Apr 1502 he was betrothed to Phillippa, dau. of Sir Richard Guildford of Cranbrook, Kent, Comptroller of the Royal Household. The marriage brought a dowry of 300 marks, and brought Gage into close kinship with a prominent Kentish family which was to play a leading role in the royal household under Henry VIII and was in turn related to Lord de la Warr, the Bryans, Vaux, Wottons, Fitzwilliams and Dudleys; Phillippa's sisters were to bring connections with the Wyatts, Culpepers, Poyntz and Brays. 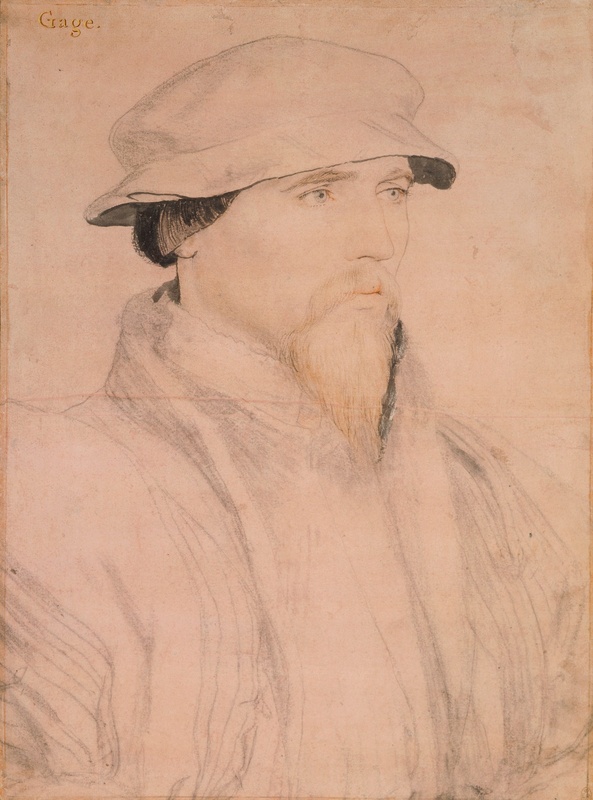 Probably through the patronage of Sir Richard Guildford, John Gage had entered the royal household as esquire of the body by 1503, one of just over ninety men by 1509 in that position who, with the rest of the chamber staff, have been described as in effect a royal affinity. However, Guildford was disgraced and withdrew from court in 1505. He died on pilgrimage in the Holy Land in 1506 though his sons returned to royal favour with the accession of Henry VIII and Gage remained close to them. Some of Henry VII's esquires of the body may have been compensated with positions in the new company of `spears of honour' formed in 1510. Gage seems not to have been continued as esquire of the body under Henry VIII, though he had regained that post by 1523. Accompanied the King on the expedition to France of Jun-Nov 1513. Knighted, 22 May 1541. Vice chamberlain of the Privy Council to Henry VIII and captain of the guard. A few years later for services done on the border of Scotland he was made comptroller of the Household and Chancellor of the Duchy of Lancaster. On his death, Henry VIII left Gage a legacy of £200, and appointed him an executor-councillor for Edward VI but, though Gage knew Somerset well during the late Henrician wars, their religious views diverged and he began a lengthy period of distance from the prevailing regime, punctuated, in public at any rate, only by his functions as Constable of the Tower. Gage received the new King there on 31 Jan and was present at Windsor on 16 Feb to break his wand of office at his master's graveside. Only after the period when Somerset was seeing off the challenges, which Gage failed to support, from Lord Chancellor Wriothesley, were the so-called conservatives Gage, Henry Fitzalan, Earl of Arundel and Sir Thomas Cheney allowed to resume their places on the council. Gage signed the patent appointing Somerset Protector on 12 Mar. Otwell Johnson reported to his brother on 22 Mar `that my maister is as he was wante to be, nor I heere of no chaunge of his offices, but even this daye (rather to the contrary) he haeth written to John Miles of Lambeth, his servant, that he wil be at the Court the Fryday befor Palme Sonday'. As late as Apr 1547, Gage was able to intervene on behalf of John Johnson and Anthony Cave in obtaining for them the contract for the King's `fells', which was being sought after by a competitor who also aimed to displace James Gage from his post and `was fayne to use veray familyare wordes of office unto them, saying that James Gage shuld not be put from them nether for Edwardes nor none other new pelter'. It was an effort, reported Otwell Johnson, `not without veray great friendsshippe ... wherfor Mr. Cave and you have veray moche to thanke him'. On 11 Jun Gage obtained for Robert Barnes, alderman of London, a licence to import gascon wines and on 26 Jun received the warrant for Henry VIII's bequest. On 29 Jun 1547, however, Gage was ousted from his council position and then his offices as comptroller and chancellor of the duchy. The reasons for this must remain uncertain. We know that Sir Anthony Browne, also a `conservative', continued until his death the following year as an active councillor; Gage's failure to maintain his position may have been part of a simple struggle for offices. What Gage was doing during the next two years is difficult to establish but it seems he retained his post at the Tower and therefore a foot in politics, though he may in effect have withdrawn to Sussex. He was included in the Sussex commission of the peace in May 1547 and the regional commission of oyer and terminer in Jun and his son James remained in post in the counting house of the royal household. However, there is in general a dearth of grants to Gage which suggests that the disfavour into which he had fallen cut off the flow of profit which he had made from monastic lands when the chantry and college wealth became available. Certainly, he fades from the pages of Otwell Johnson's letters, replaced as contact at court by Armagil Waad among others. Otwell continued to manage his wool sales as late as the summer of 1548 but after that there is little to be heard. The rapidity with which he re-emerged in 1549 is, therefore, all the more remarkable. In the crisis of Somerset's overthrow, he joined the London lords and suddenly reappeared at the Council in London on 6 Oct, signed the Council letter declaring Somerset's treason and as Constable received the Protector and his allies into custody at the Tower on 14 Oct. Thereafter, he resumed his role as Council specialist on military supplies for Calais, all the more urgent in view of the outbreak of war with France in Aug, attending the Council regularly to the end of Oct, again in Dec, though then not again until Mar-Apr 1550. The nature of his attitude to the new regime is unclear. There is no evidence that he was drawn into the Wriothesley - Arundel plotting against Warwick at the end of Dec. However, though his wife was aunt to Warwick's wife Jane Guildford and he had worked closely with Warwick in 1545, he may have had little sympathy with the new head of the Council's policies and attended only infrequently in 1551 and not again between Apr-May 1552 and the end of the reign, except during the King's progress in Sussex in Jul 1552. He was supposedly too ill `for his age and sickness' to attend the Garter chapter in Apr 1553. His interests were not entirely neglected. Gage held the stewardship of Cromwell's lands in Sussex, while the King's interest was held by Anne of Cleves, who was required to surrender her patent in Aug 1551. His son Edward joined his father on the Surrey and Sussex benches and other local commissions in Dec 1551. It is clear though that by 1552 Gage had withdrawn again from central government. When Gage refused to side with Northumberland's attempt in Jul to set up Lady Jane Grey as queen, he was suspended as Constable but received the Duke as prisoner into the Tower. Restored as Constable of the Tower, he greeted Mary on her arrival in London and was created Lord Chamberlain (one of the few in that office in the sixteenth century to remain a commoner) and then received the new Queen at the Tower for her coronation. There is every reason to suppose he welcomed the return of Catholicism and almost immediately we see the fountain of royal patronage opened up again, especially with an extensive grant of land in Jun 1554, partly confiscated from those attainted for treason, designed by Gage to endow his sons Robert and William with an estate. This included some property in Sussex that had belonged to Lewes Priory and then passed to Cromwell, which reveals local tensions. On the very day of the grant, the Imperial Ambassador Renard reported that the Earl of Arundel had loudly protested against it and that it had been suspended. It was renewed the following Feb with even more extensive concessions. Wardships and the grant of the stewardship of Southwark held by the attainted Duke of Suffolk followed. Underhill's account, perhaps exaggerated, (204) is an example of the process by which Gage became something of a grim figure in Protestant historiography. In Mar 1554 when Princess Elizabeth entered the Tower, he was said to have treated her severely, though Heylyn says `more for love of the pope than for hate of her person'. As Constable of the Tower, he regularly brought state prisoners to the bar at Westminster Hall or Guildhall, especially after the Wyatt rebellion, the last case being that of Robert Dudley at Guildhall on 22 Jan 1555. He is usually thought, on the basis of reports by Renard, to have supported Gardiner against Paget and Arundel in council politics, though he seems to have joined with Paget and others in opposing Gardiner on extreme measures against Elizabeth. Among his colleagues, he was closest to Sir John Baker, his old colleague in the Calais commission of 1540, naming him in his will as `my singuler undoubted good lover and freende'. As Lord Chamberlain, he was responsible for the swearing in of Felipe's household and was allocated a gold chain worth 150 crowns as well as a pension of 1000 crowns on Renard's advice. He was train-bearer at Mary's marriage to Felipe in Winchester in Jul 1554 and received Felipe and Mary at Saint George's house in Southwark before their entry into the city. His last public act at court was to attend (along with the Lord Admiral and Secretary Petre) an audience given by the Queen to the French Ambassador in Jul 1555. Gage last appeared at the Privy Council on 15 Aug 1555, though he continued to receive instructions on the policing of Sussex until Mar 1556. The provisions in his will for servants who came with him from the court `for their paynes in watching with me' suggests a protracted illness. Curiously, Gage seems to have been unable to push the interests of his family during Mary's reign despite his early declaration of allegiance. The obvious case is that his grandson the young Sir Anthony Browne failed to obtain any court office in 1553 and was compensated in Sep 1554 with the title viscount Montagu. As a peer he was the obvious choice to succeed his grandfather as Lord Chamberlain but was again passed over in 1556. The reason seems to have been his lack of political acumen, though he was appointed to a number of embassies in the late Marian and early Elizabethan periods. Of Gage's own sons, James seems to have withdrawn from court under Mary, though he kept his post as master of the household until his death. Robert cannot have benefited from being deputed by Mary to help oversee Elizabeth at Woodstock. Edward continued as J.P. for Sussex under Mary along with his brother James and his kinsmen Sir Robert Oxenbridge, Edward Lewknor, John Ashburnham and John Culpeper. Edward acquired the reputation of a fierce persecutor of Protestants. Thereafter, they suffered the usual vicissitudes of Catholic gentry. Edward died in 1567 and Robert in 1587. He distinguished himself in a very extraordinary manner, both in military and civil capacity, and became one to the most famous men of the age he lived in, whose great services are set forth in an ancient manuscript, written by his third son Robert Gage of Haling in Surrey. It is published in the supplement to Collin's Peerage of England.